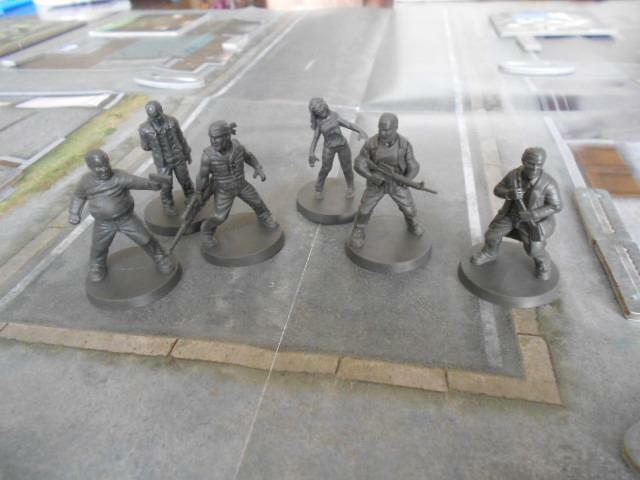 It's time once again to delve back into the world of Mantic's Walking Dead tabletop skirmish game. SPOILER ALERT! 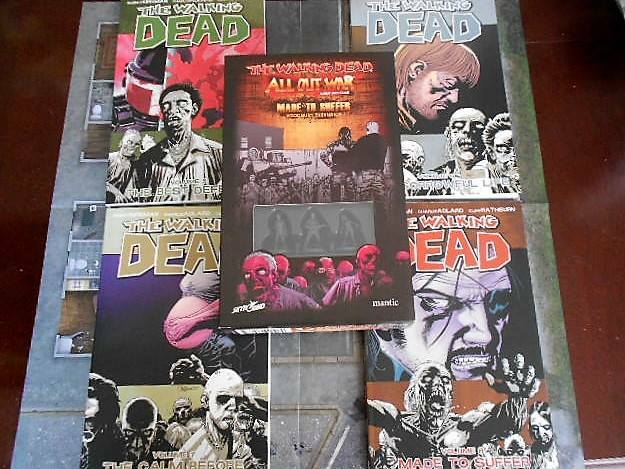 If you have read this far I will assume you know enough about the Walking Dead that any references to storylines or plot (in comics or TV incarnations) with regards to characters or places in this set will not hold any surprises for you. Otherwise, support your local comic shop (or corporate television broadcaster) and get up to speed damnit! Without any further ado, it's welcome to Woodbury. Have you met the Governor yet...? So, as expected, we've skipped a couple of graphic novels to get us to this point. To be fair, the day to day lives of a bunch of survivors hiding out in a prison does not make a great tabletop skirmish! The wave 4 expansion box is sub-titled "Made to Suffer", which is actually the name of the 8th graphic novel, but the narrative campaign covers events from GN's 5, 6, 7, and 8. This box holds the usual goodies: 20" playing mat with minis checklist on the reverse, heavy duty card 2D scenery and tokens, 6 plastic miniatures and associated cards, plus event, supply and equipment cards. Still a reasonable amount for your purchase! Diving straight into the main expansion we have a handful of new rules. 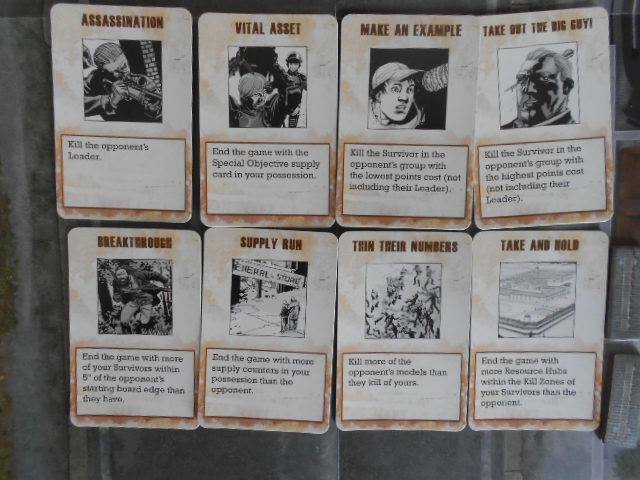 Firstly we have rules for smoke, to accompany the smoke grenade equipment cards, including missed targeting, drift and dispersal. Then we have a "Special Objective" card. As the name suggests this card is shuffled into the supply deck at the start of the game to indicate an object vital to the scenario. 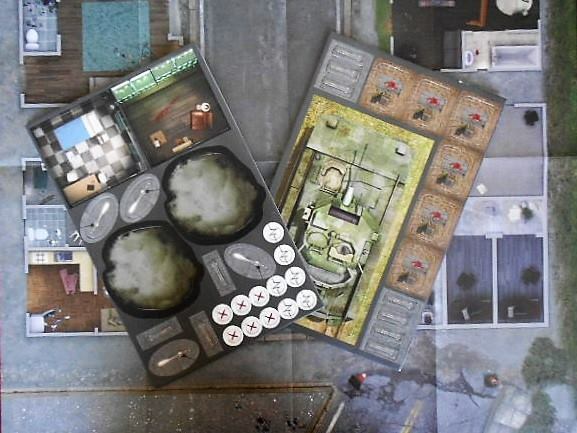 There are also rules concerning the new scenery markers, lamp posts as light sources for night fighting, special objective rooms (Infirmary and "Trophy Room"), and walker stakes for tethered walkers in the Woodbury arena scenario. A couple of previous rules are repeated, including the "Walkers inside buildings" rules: Once again, you do NOT want to get caught inside a building, these suckers move fast! The narrative campaign consists of 7 chapters, covering (as mentioned above) all the major Woodbury encounters from across the comic series. This gives you some really interesting scenarios to play through, not least of which is the first chapter, The Arena. Two survivors battle it out in a ring of tethered walkers! The walkers can react as usual, but always end the round back on their stakes... unless cut free by a desperate fighter! Chapter 3 has a vengeful Michonne searching for her katana and the Governor, which may or may not be in the Trophy Room with Penny... Chapter 5 includes the tank scenery piece in the attack on the prison, with rules for firing the cannon! 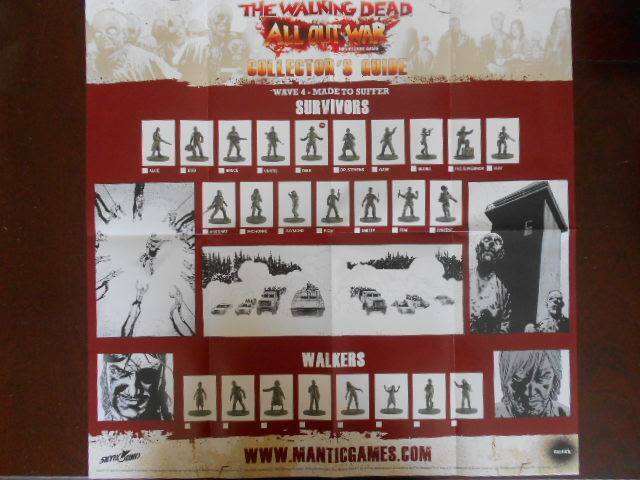 The last part of the rulebook concerns larger games and alliances in the Walking Dead story. 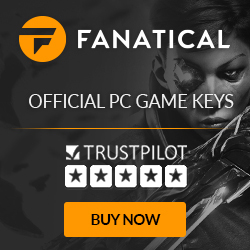 There is a matrix listing all of the current factions represented in the game which indicates whether factions are enemies, trusted or tenuous allies, or automatically friendly. This is followed by an All Out War scenario for games up to and over 1000 points, on boards up to 60" x 40"!!! My kind of game! As an added bonus there are also 8 Objective cards to gain you additional points: Each player takes two at the start of the game and reveals at the end, gaining the owner a bonus of 10% of the game's starting points value for each one completed. Objectives include taking out certain characters, holding resource hubs/supplies, and finding the Special Objective card. Full marks to Mantic for still finding ways to expand this game! The booster boxes for this wave are all nicely themed around the expansion box. All the characters are directly connected to the Woodbury story, with every box containing one or more characters with the "Woodbury Army" logo in the corner. Including the survivors in the box this gives you a sizeable faction to at last rival Rick's party! 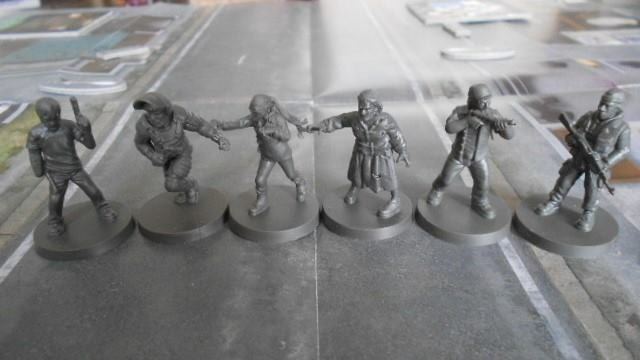 Add to this the usual fine selection of brand new walker sculpts, from varied walks of life, with varying levels of damage and decay, and you have another top drawer release from Mantic! 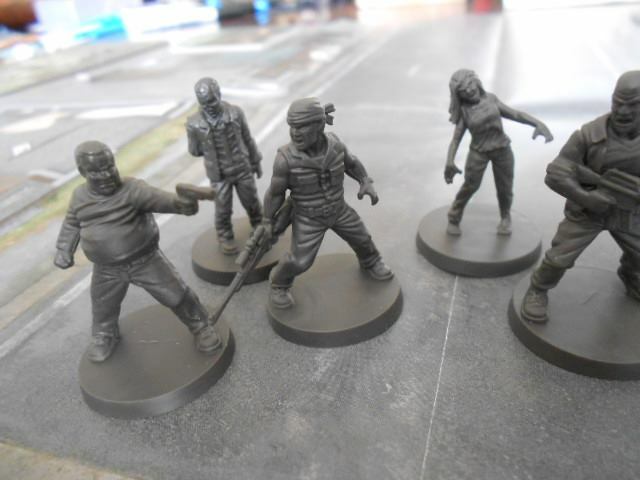 This set has survivors in some classic poses from the comics: The Governor leading the fight against the prison, Rick mutilated but darkly defiant, Doc Stevens and Alice, and Tyreese in riot gear still wielding his hammer. Once again the attention paid to the comics by the designers and sculptors shines through. As usual this is a very impressive set of releases. 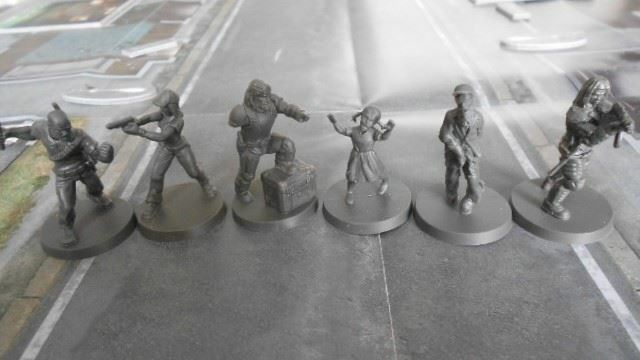 The consistently high quality of the miniatures and accessories, and the continued pushing of the boundaries of the game mechanics ensures the longevity of the All Out War project. There are one or two little niggles. The new Michonne sculpt, in riot gear with an SMG rather than the katana, would have been better served as a two piece model. The pose is a little awkward and there is a lump of plastic filling the space between the gun and the body which could prove a pain for mini painters, and detracts from the overall quality of the piece. A sligthly over-ambitious sculpt. Also the expansion box comes without a Governor in it! 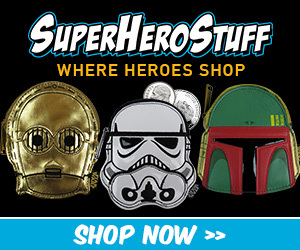 To get him you need to get the booster box or the solo expansion from Wave 1. 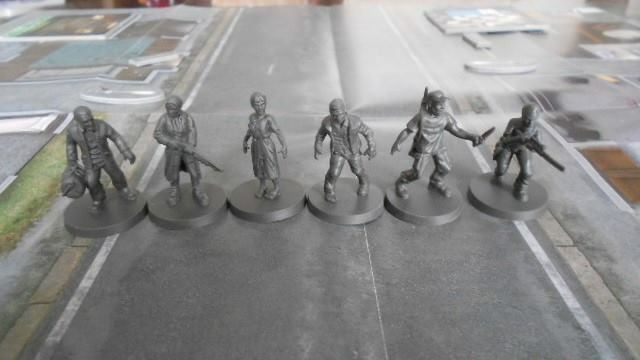 Once again it feels a bit like a money grab as many of the scenarios require minis from earlier releases, and there is a general assumption that you are buying everything as it comes out and are completely up to date... But let's face it, you probably are!!! Special mention for the Martinez sculpt in the main box at this point - Superb! When the quality is this high and the prices are (comparatively) low you can afford to keep this one going. This is still one of the best IP games on the market, and a fast, basic system that can be adapted and complicated to whatever level you are comfortable with. Not sure what will be coming in the next set of releases. Maybe some gap fillers from Hilltop, or jump ahead to the Saviors? I would like to see a collected set of additional rules, either as a pdf or a slim volume game book, to tie them all up in one place rather than flicking through 5 different rulebooks to use them in your own games. And would love to see Mantic come up with a woodland scenery solution to get the price of model trees down! But that's just me... Looking forward to the next release with the usual sense of anticipation, but for now grab the nearest object on your left, it's walker killing time! By day, David Mustill is a Human Workhorse for a chemical company. Naturally, every possible moment away from this existence is spent gaming and painting miniatures. A steady diet of rock, metal, punk, comics, gaming, miniatures and genre movies has moulded David into a renaissance geek, for whom no gaming company or genre is too obscure, and no graphic novel is unreadable.